This picture is from Crest Nicholson. it is similar to the one in the brochure that they were handing out to everybody who attended their public exhibition in Green Park, but this has been updated to reflect the revised building heights. These buildings are described as "designed to complement, not compete with the magnificent existing historic Georgian architecture". But of course, they do compete because the architect has made the proportions of his buildings glaringly different from the norm for Bath. And then the leaflet compares the height of the Western Riverside with the Empire Hotel, which is Victorian, not Georgian, and also the largest gasometer, which of course is of 1950s vintage. So on this page, you can see other comparisons. First of all, although the Western Riverside is intended to be almost entirely dwellings, the building design bears an uncanny similarity to the new Scottish Widows office block in Finsbury Square, in London, pictured right. Should new dwellings in Bath be designed like a London office block? 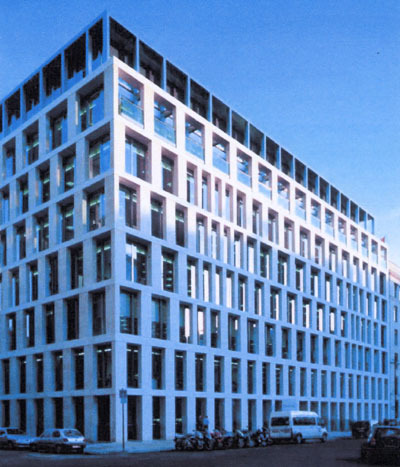 The Scottish Widows building was the work of Eric Parry Architects. If you follow the link to view their website, you will see how many awards it gained. Could it be that Feilden Clegg Bradley chose a similar design for Bath in the hope of a nomination for an award, regardless of how out of place these proportions would be in a city built on a human scale from the classical template? 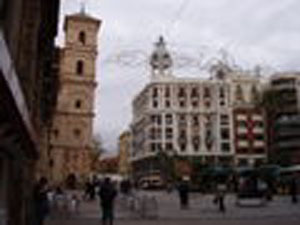 And here on the left is Plaza de Santo Domingo in Murcia, Spain. It is not quite the carbon copy that the Scottish Widows office block is, but the similarity is close enough to confirm that the style is a current fashion rather than designed for Bath. 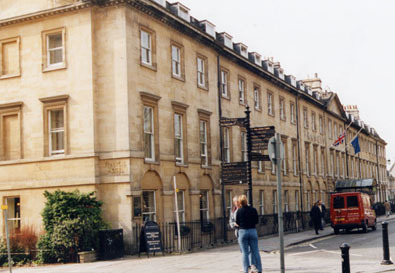 Now compare the type of buildings that earned Bath its World Heritage status. 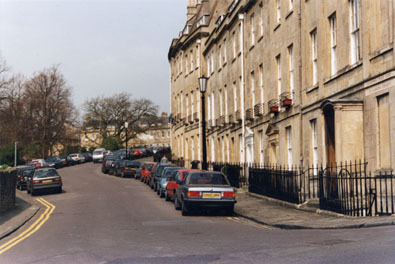 On the left is Queen Square (on level ground), on the right, Lansdown Place East (ascending a hill) with Lansdown Crescent in the background. Note the standard height of three floors above the pavement level floor, the top one partially concealed within the roof space. 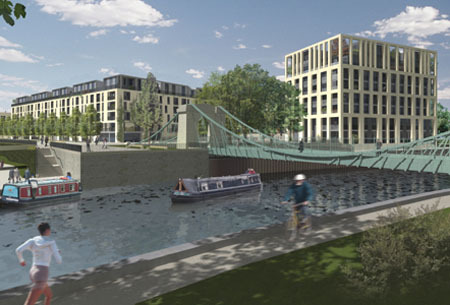 When classical Bath is put on the same web page as the Western Riverside proposals, it is easy to see why many find the proposed design of the Western Riverside uncomfortable. Finally, at the planning meeting, committee members berated some of the objectors for likening the Western Riverside architecture to "Eastern Bloc" designs, so the picture below is provided to allow you to make up your own mind about who was right. That picture is from a picture postcard of a town in East Germany, and because it is a picture postcard it attempts to give a pleasant view. Apparently, behind the visible blocks in the picture are block after block of almost identical buildings in a high density development - a bit like the Western Riverside really. 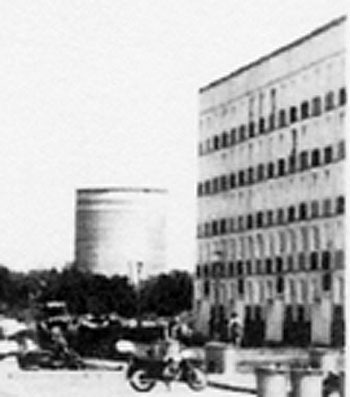 It was not until the picture had been blown up to use on the website that the other similarity with Bath became obvious. Look at the picture on the right which is a magnification of the right hand side of the picture above. 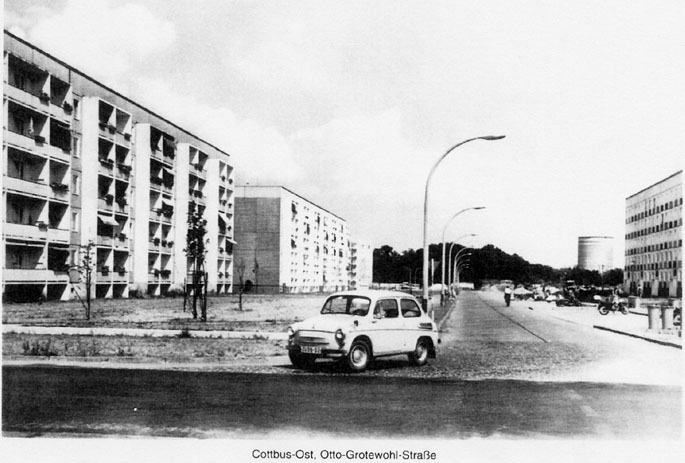 And look - Cottbus-Ost has its own Busometer!